"When I look back at the work I produced it is clear that I have always worked in themes. They may go on for some time even years. I feel there is an evolutionary process at work. I have always had a strong attraction to coastal seaside images, having lived on the North Wales coast for most of my life it is of no surprise that seaside images have dominated the content of my work. 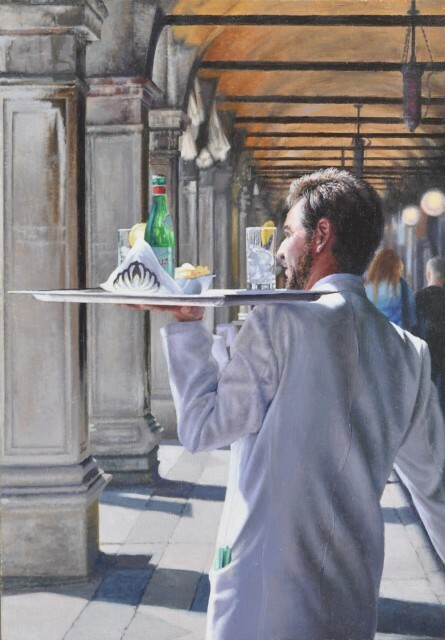 I have often painted scenes from café interiors with the outside visible usually the sea in the distance, I am fascinated with the relationship between the outside and inside and the intangible experience it provides. The paintings are not an objective report on the natural world they have heightened intensity of colour and tone therefore it is a mix of observation and the experience of being in the moment, time spent and experienced. The locations act as a back drop to distant memories and more recent experiences." These paintings are meticulous in their detail, but are not merely photographically objective. Mike arranges his scenes precisely, heightens the colours and tones, and intensifies the contrast between the light and the shadows. The images become laden with feeling, foreboding and control. A single cup abandoned at an empty table, the light shining through the folds of a tablecloth, or a car sagging at the kerb in the heat - these scenes and details give the work real psychological drama and tension. Fleeting moments are caught and held for our examination, throwing out questions and possibilities that never usually have time to form, and the fact that these moments are made painstakingly slowly over weeks and months of careful work only adds to their fascination. Mike Briscoe lives and paints in Colwyn Bay. He is represented in many public and private collections. He will return with a new body of work in March 2019.